Let’s be real. 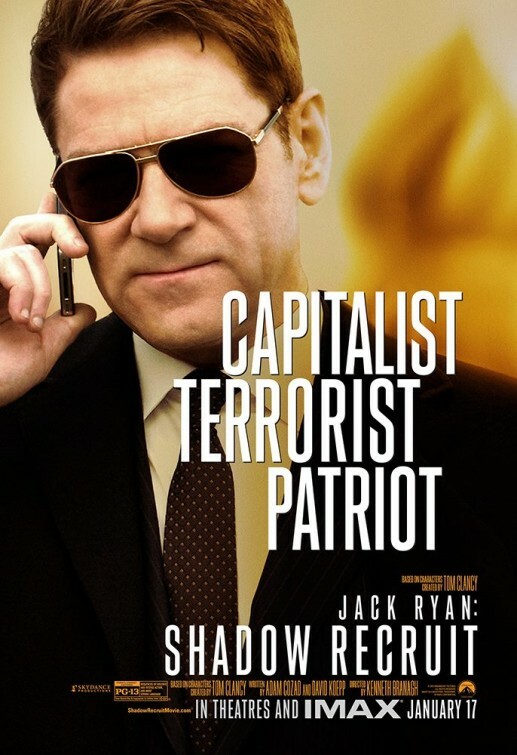 The reason this movie is called “Jack Ryan: Shadow Recruit” and not just “Shadow Recruit” is because “Jack Ryan” is a brand name. Paramount needs to make that obvious to all as they aim at rebooting Tom Clancy’s most popular character with a younger actor (both to connect with a younger generation and to give the franchise longer legs), even though the tried that in 2002’s “The Sum of All Fears” with Ben Affleck. Director Kenneth Branagh (coming off the success of 2011’s “Thor”) obliges by making an actioner that starts out promising, albeit with plenty of pauses for set-up, yet ends up suffering from feeling similar to other political/spy thrillers within the past twenty years and obviousness. “Shadow Recruit” starts out in 2001, where we find young Jack Ryan (Chris Pine) in graduate school at the London School of Economics. After 9/11 occurs, Ryan is motivated to join the marines. Three years later, Ryan’s helicopter is shot down in Afghanistan, resulting in a crippling back injury. The attempt to update the man who would become CIA analyst and reluctant hero for the 21st Century, freeing him of any Cold War residue, is a logical move. These two pivotal moments in Ryan’s new origin offer some nice set-up for who he is, but they unfortunately feel like formulaic beats. It was obvious what Ryan was going to do next after watching footage the attack on the Twin Towers and even moreso what would happen while he was in that chopper. While recuperating at Walter Reed Hospital, Ryan struggles through rehab and manages a meet-cute with Cathy (Keira Knightley) an attractive (of course) med student. He’s also being observed there by mysterious CIA agent William Harper (Kevin Costner), who’s eyeing Ryan for his intuitiveness and intelligence. Through some tenacity, Harper recruits Ryan, positioning him in Wall Street where he’ll study financial patterns that could lead to possible terrorist activity. That’s where Harper wants him and where he stays for the next ten years, catching us up to 2013 (which is when the movie was supposed to have been released). It’s also one of the more convenient (and again, quiet obvious) plot points made by screenwriters, Adam Cozad and David Koepp. Of course Ryan finds suspicious encrypted files that are linked to Russian businessman, Victor Cherevin (Kenneth Branagh), and, still under the guise of his covert day job, is sent to Moscow to audit the files of this enigmatic figure. Why else would such a role be written for Ryan if it wasn’t designed for him (and viewers) to inevitably meet “the bad guy” of the film? Too bad it’s not very obvious how Cathy and Ryan are now a couple. There’s no spark or any flirty fooling around about this couple in the present, at least not since we last saw them circling each other around Walter Reed. All we see is misguided (and stereotypical) jealousy on her part and continuous “marry me” attempts from him. It’s never clear why Cathy has eluded Ryan’s marriage proposals over the years, which makes it hard for us to invest in them as a couple in love. We’re left scratching our head about this couple. It’s as if the studio insisted on including a “Love Interest” for Ryan, whether or not the character fits. She would, if Knightly’s character was developed a little more or if Branagh had taught her how to perfect an American accent like he did in “Dead Again”. As for that bad guy, Ryan learns that he has plans to drain the U.S. dollar into a New Great Depression, covering it all up by blowing up stuff in New York City (of course) to make it absolutely clear that, “U.S. BAD!!”. Meanwhile, the audience learns that the Branagh’s Cheverin has been injured in the past and is hooked on heroin, which he can only tolerate administering himself. That’s about all we get out of Cheverin, a character who had the potential of being one of the most interesting characters of the movie. I’d like to think that Branagh had his hands full directing “Shadow Recruit” or working on his thick Russian accent, instead of stopping to think how his character ultimately winds up being a limp Bond villain. 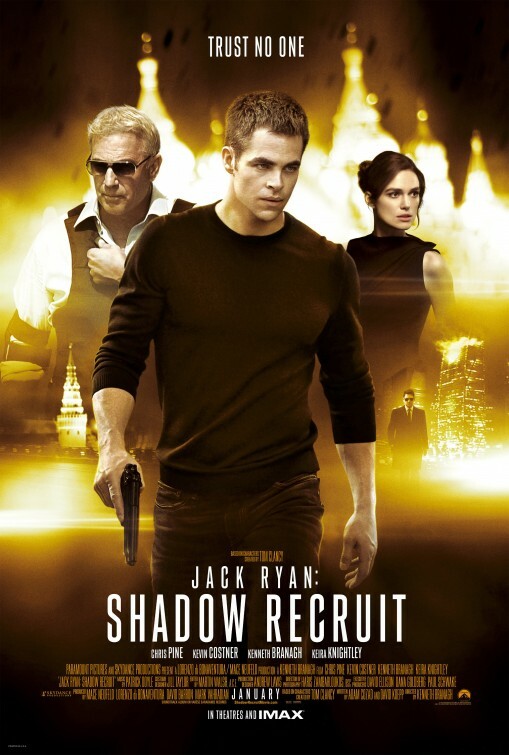 With Cathy getting caught in the mix, Harper guiding along Ryan and Ryan making sure everything is downloaded in a timely manner, “Shadow Recruit” never misses a predictable beat. Everyone has their roles and meets them in a serviceable manner. It’s not a bad movie, it just feels like it wants to be a blockbuster and it doesn’t realize that it doesn’t need to be. It just reminds us that this kind of movie is in the shadow of the Bourne movies and comparison is both futile and inevitable. As for Pine, it’s hard to watch him exert charm and hotshot heroism and not think James T. Kirk. It’s understandable that this isn’t the Jack Ryan we know – one who’s more of a thinker (which Alec Baldwin had down in “The Hunt for Red October”) and reluctant action hero (which Harrison Ford started as in “Patriot Games” and later ended up hanging from a helicopter in “Clear and Present Danger”) – since we’re starting over and trying on a different/new/younger Ryan with a potential for additional sequels. Pine just isn’t differentiating himself enough from Kirk, or even – Generic Action Guy – for me to feel like I’m seeing a reinvention of Clancy’s character. At least, Costner grounds the movie with Harper’s quiet and mysterious experience, similar to what Connery did for Costner’s Eliot Ness in “The Untouchables”. Honestly, his role here was the only reason I had any anticipation for this movie and he didn’t disappoint. I found myself wanting to see a Jack Ryan played by Costner – at the age he is now – wisened, patient and cautious. But that’s not how you sell tickets to a character who supposedly should be racing around on a motorcycle and trying to figure out how to defuse a bomb. It’s ironic to note that Costner was originally offered the role of Ryan back in the late 80s, but was busy on this little film called “Dances with Wolves”. As expected, “Shadow Recruit” positions itself for sequels. It’s a product after all. Maybe in the next installment I can get used to Pine as Ryan, but he might be flipping back to “Star Trek” before the next one, which would leave me feeling the same way I feel about his Jack Ryan right now. While I’m not opposed to another Jack Ryan movie, I’d also be fine with out. Just please don’t call it “Jack Ryan” and please remove all the obviousness.